Having very much enjoyed Elizabeth Fremantle's Queen's Gambit (my review here), I was excited to be able to offer my followers this chance to win Elizabeth Fremantle's newest work shown above, Watch The Lady. Q: What drawbacks have you encountered now that you have fulfilled your childhood dream of becoming an author? That’s an interesting question. I suppose that I now feel I have to improve with every book I publish. I want to challenge myself to write a better, more complex novel each time, building on the previous work and learning from my mistakes. I don’t want to be that author who wrote one good book and then wrote fundamentally the same book over and over again after it. I have high expectations of myself, which makes me anxious I won’t live up to them, so inevitably halfway through a first draft I have a crisis of confidence and feel that I’ll never make it work. I have learned through experience how to push through no matter what. Q: As a younger self, what types of stories did you see yourself writing? Funnily enough not historical ones. When I was very little I wanted to write about animals – the echoes of that live on in my novels which are full of dogs, horses, birds, even a pair of monkeys in Queen’s Gambit. I was always, and still am, interested in factual based narrative and never wanted to write about fantasy. Q: What would you say sets yourself apart from other writers of the Tudor era, and what would you say to those readers who say they have no desire to read another Tudor novel! I don’t read much other Tudor era fiction primarily because I want to keep my distinctive voice and not worry about whether other people are doing it better than I am. But I’d say my novels aim to be expansive and multi-focused. I also tend to focus on less-known figures from the period, so it’s unlikely I’d write a novel about Anne Boleyn as so many others have tackled her story. I’m more interested in the forgotten or misrepresented women, like Penelope Devereux or the younger Grey sisters. Q: What is one of the things that you remember as surprising you about Lady Penelope? Penelope Devereux really was an extraordinary woman. I knew very little about her when I began my research, only that she’d been Sir Philip Sidney’s muse and that she was involved in some way in her brother’s insurrection. I was astonished to discover the extent to which she was making secret treasonous allegiances with a foreign power and also that she was much more deeply involved in the Essex plot than I’d previously thought. Q: In your writing of WATCH THE LADY did you come across any characters that you felt you needed to give a more positive tone? Any character that you had trouble writing? I thought Robert Cecil might be a challenge, as he seemed such a dry figure, but as it turned out he came to life on the page and became one of the main narrators of the story. Sometimes characters simply write themselves and he was one. Perhaps it was Lord Rich, Penelope’s husband, who I found difficult. there’s very little about him in the record and what there is makes him seem cowardly and unpleasant but I wanted to create him as a fully rounded character. He is an antagonist in Penelope’s story but I felt I needed it to be a complex relationship and not simply black and white. 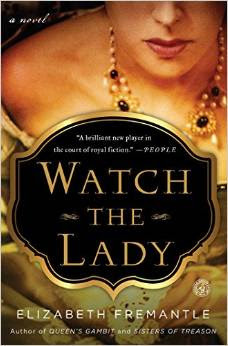 Q: Which novel was the most fun to write, WATCH THE LADY or THE QUEEN'S GAMBIT? Probably WATCH THE LADY; it was not an easy process but I had more confidence than I did when writing QUEEN’S GAMBIT and so it was a less tortuous process. QUEEN’S GAMBIT had to be rewritten from scratch at a late stage because the pacing simply didn’t work, which was excruciating. There are really pleasurable elements in the process of writing each novel; the moment a character takes shape, is one. For example when writing Katherine Grey in SISTERS OF TREASON her voice was so distinct to me that the writing flowed with ease and that is the most wonderful feeling as a writer. What a pleasure to host Elizabeth Fremantle today on Burton Book Review! Courtesy of Simon and Schuster, we have one copy to give away to my USA readers.